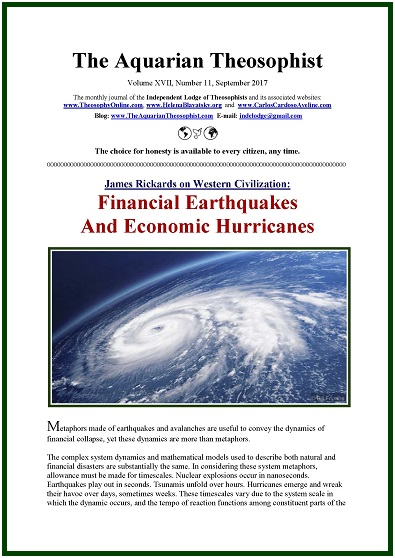 On page one, the “Aquarian” presents a fragment from James Rickards: “Financial Earthquakes and Economic Hurricanes”. After that we see “Farewell to Blind Materialism: the Philosophy of Economics”. “Awareness and Discipline” is on page three. “Examining Consciousness: The Entirety of the Self” can be read on page 4. On the same page we invite our readers to make an intercultural exercise and visit a new website on spirituality published in the country where Helena Blavatsky was born: Russian Faith. * Why Do Animals Suffer? – an article by Helena P. Blavatsky. The 12-pp. edition includes the List of New Texts in our associated websites.